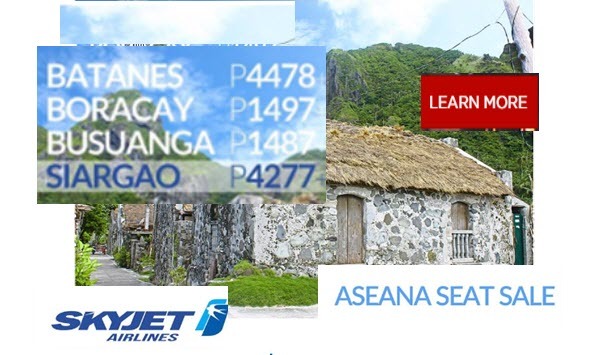 Is traveling to BATANES, SIARGAO, CORON, BORACAY one of your dreams? The Skyjet promo fare 2017 may be the venue to for that wish to come true! And wait, here is a bonus! You may book for your summer trips to the above amazing destinations. Is it not exciting to have your vacation or bonding with friends in these fascinating places? Yes, it is possible to reach these places via Skyjet Airlines seat sale 2017. Travel dates for the promo are: March 16- 31, April, May, June, July, August 2017. Booking period for the promo is until March 17, 2017 but promo tickets are limited so, if you want to avail the Skyjet sale tickets, buy your tickets right away! Here is 2017 List of Holidays and Long Weekends to aid you in planning your travel dates. Skyjet promo tickets are limited and subject to seat availability. Quoted Skyjet promo fares are valid for one-way trip. Included in the ticket are the base fare, VAT, 5 kilos hand carry bag and checked baggage of 10 kilos for adult passengers and 5 kilos for children. Excess baggage fee is P150 per kilo inclusive of VAT. The Skyjet promo fares can be exclusively purchase at Skyjet’s ASEANA Ticketing Office. The office is located at Aseana One Bldg., Bradco Avenue, Paranaque City (in front of S & R, Ford, DFA and Red Planet). For inquiries, call Skyjet Airlines hotline number: (02) 863 1333. Do you want more promo fare, PISO FARE to Boracay, Batanes, Coron, Siargao or other local or foreign routes? LIKE and FOLLOW us in Facebook: PISO FARE Ticket for airlines’ promo updates and travel tips!! !